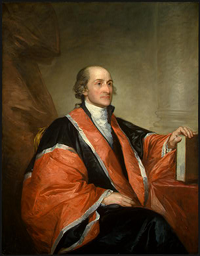 John Jay was a member of the Continental Congress from 1774 through 1779, serving as its president in 1778-79. He drafted New York’s first constitution in 1777, was the chief justice of the New York supreme court in 1777 and 1778. He became the United States minister to Spain in 1779, and signed the final peace treaty with England. He was the US secretary of foreign affairs 1784 to 1789. He was one of the Constitution’s most outspoken proponent, and in 1789, he became the first Chief Justice of the United States Supreme Court and finally, the governor of New York from 1795 until 1801. The co-author of the Federalist Papers was elected president of the Westchester Bible Society in 1818, and in 1821, John Jay became the president of the American Bible Society. Now, one could argue that the first Chief Justice of the United States of America is likely to have had a better idea than any of our current Justices as to the intent of the Founding Fathers, since he was one and knew most of them. “I do not recollect to have had more than two conversations with atheists about their tenents. The first was this: I was at a large party, of which were several of that description. They spoke freely and contemptuously of religion. I took no part in the conversation. In the course of it, one of them asked me if I believed in Christ? I answered that I did, and that I thanked God that I did."